Kings of Leon | Do You Hear The Music? Another year down, another year filled with great tunes. Below is a list (in alphabetical order) of 50 albums I dug in 2016. Normally I shy away from naming my top album because quite frankly I think there is too much great music that gets released throughout the year but this year is different because to me, A Tribe Called Quest didn’t just shock everyone by announcing and releasing its first album in 18 years, coupled with the loss earlier this year of Phife Dawg but it was the perfect album at the right time when “We The People” needed it. We Got It From Here…Thank You For Your Service is the album of the year and if you haven’t for some reason, dive into it, listen closely. We need more like ATCQ in 2017 and the years to come, there is a purpose to this album, find yours as I found mine. Peace + Love + Music. See you in 2017. This morning we announced the dates for the 2014 Life is Beautiful Festival in Downtown Las Vegas, October 24-26! Still reeling from Life is Beautiful 2013? Check out the festival recap video below! Music video or narrative? Here’s the new video for Kings of Leon’s “Beautiful War.” Nearly seven minutes that I think your eyes will be glued to. Well it came and went and now the countdown to Life is Beautiful 2014 is underway. Wow, what a wild year 2013 has been. I don’t know if I can yet fully put into words just exactly what the last 12 months have been like but to go from this idea of a four festival in one weekend to actually seeing it come to life and people having the best weekend ever was truly special. It’s not just the music that stands out to me as the shinning moments but rather the memories of people grinning ear to ear and having the best weekend ever. all my people in the box office and credential trailer, thank you! sure there were a whole lot more memories but I hope this gives you an idea…. Slowly I’m crawling out of the hole I was and getting a chance to see friends, catch up on life and return to the “real world.” Thank you all for you patience as I at times was unresponsive, non committal and sometimes short. I hope you didn’t take it personal, I was just embarking on an adventure that would consume me. Was it worth it? Every second! Figure now is as best a time as any to start a little countdown to Life is Beautiful. I can’t believe how fast the last year has gone and here we are just three weeks away from the festival kicking off with our Grills & Guitars party with music by Dawes and Todd Rundgren. But in honor of 21 days from the festival, here’s a little music from twenty one pilots who will be performing on October 27. Hope to see you in Downtown Las Vegas and join me for what’s going to be an epic weekend. 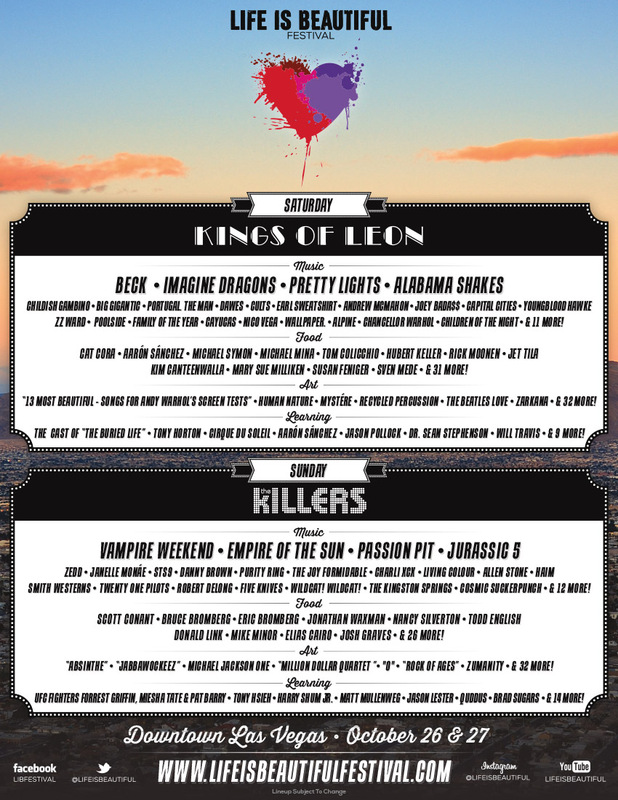 Here we go……just a month away from the inaugural Life is Beautiful Festival in Downtown Las Vegas and now the fun for you can really begin as this morning we released the single day schedules! Give a look and let me know what day and who you’re most excited to see! Also this Friday at 10 a.m. SINGLE DAY TICKETS go on sale! Heading into the holiday weekend so why not drop a new playlist a few days early. Hope you have some great plans this Labor Day Weekend and if you’re planning an end of summer bbq or hitting the open road, perhaps this little playlist will make it that much more enjoyable. Wishing everyone a fun and safe holiday weekend.